I've ridden various modified versions of the Yamaha R1 for about nine years now and have become an advocate for their brutal speed, stable chassis and faultless reliability. So when a stock 2014 R1 was delivered to RideApart's main offices, I naturally volunteered to put it through its paces. Arriving during the Los Angeles "winter," the subsequent rain and strong winds meant we weren't going to get an opportunity to track test it, or even get it close to the outer limits of its performance. So we decided to make it a comparison test against my own 2008 R1 on my daily 55-mile commute—with some weekend shenanigans thrown in. The latest flat-plane cranked 2014 R1 has some very obvious advantages over its older sibling—most noticeably its technology. I was particularly grateful for the traction control and drive modes for the drive-by-wire throttle when I encountered inclement weather. While many riders eschew the newest technology in favor for a more pure, more analog experience, I welcomed the opportunity to remain upright in difficult conditions. I took full advantage of the gadgets, fiddling with the seven-level traction control as conditions dictated – dialing in considerably more in the rain for peace of mind. This is easily selected from the handlebar rocker switch and visualized by a bar graph on the LCD display. The traction control can be used in combination with the D-MODE selector that gives you three choices of throttle actuation, making it more precise at low to medium speeds (Mode A), or dulling its sensitivity for tricky conditions (Mode B) with the standard setting offering the best of all worlds. To be honest, I found the more sensitive setting a pain since bumps in the road would cause you to wind on a little more throttle; therefore, causing the engine revs to seesaw. It felt uncomfortable and was difficult to make progress on anything other than the smoothest roads. I also tried Mode B in the rain, but since I was familiar with using less gas in slippery conditions, I didn't find it particularly useful. However, somebody with less experience in the wet would undoubtedly benefit from its reduce sensitivity. When it wasn't raining, and I was able to turn off the traction control and open up the 998cc in-line four, it brought a smile to my face. The engine's design provides a linear power delivery that ensures impressive application and good traction. In fact, it was so good, it almost felt tame in comparison to some of its liter-bike rivals. This also had you questioning its weight, but at 454lbs, it's not exactly portly. The flat-plane crank produces a noticeable vibration in the mid-range when you open the throttle to overtake. With earplugs fitted, you don't hear the Ducati-esque engine note, but do feel the vibration every time you twist the grip. It's not a major gripe, but the flat-plane cranks' uneven firing order doesn't have the smooth power delivery of some of its rivals. Having sung the praises of the 2014 model's technology, I don't want to give the impression that the six-year old 2008 R1 is a dud. In fact, it shares a number of the same technologies, such as a fly-by-wire throttle system, slipper clutch and six-piston front calipers. It also has variable intake funnel length for a broad spread of power, which is where this superbike scores big over the newer model. At this point, I should explain it's not a level playing field. The older R1 has a number of upgrades that give it the upper hand in terms of power and flexibility. These include a Bazzaz power module with a custom tune from WestCoastGP Cycles. It has Yoshimura slip-ons in order to retain the cat and a kevlar clutch. I also fitted a lightweight DID 520 race chain and sprockets. This included a +2 rear sprocket to reduce weight and friction, making the gearing more aggressive. Finally, I added a Speedohealer to compensate for the altered gearing. Claimed to be of the most powerful stock R1s ever tested by a couple of Los Angeles dyno facilities, I started with a good platform. Adding the Bazazz and exhaust bumped the power to almost 190hp at the rear wheel. Also, lowering the gearing on this explosive combination has produced a phenomenal machine that makes most other liter bikes seem pedestrian. Combined with its extremely smooth fly-by-wire throttle, it's very easy to ride this bike in all conditions. You can make small throttle adjustments and get precise responses at the tire. So whether you're leaving black lines exiting a canyon corner, or trickling through stationary traffic on a wet freeway, this modified 2008 R1 has been a dependable and exciting companion for many years. As I started using and comparing both R1s, I quickly realized there are plenty of similarities, despite the six-year gap. Of course, there are plenty of differences to keep it interesting, and both will find fans. As my daily rider, the '08 model never disappoints. It's possible I've learned to ride around its faults, but when other riders have jumped on board, they're usually impressed by its power, smoothness, tractability and precision. Perhaps its only real fault is one that's easily fixed. The suspension was set up by the great Andrew Trevitt in order for it to be a stable at high-speeds on Willow Springs Raceway. The consequence is that it's rather slow to turn in, making tight canyons rather challenging. The upside is that it'll remain rock-solid taking wide sweepers at 120mph or more. While I've played with the settings slightly, I need to find a local suspension specialist to dial it in properly (I smell a follow-up story.) That said, it's incredibly versatile—great as a commuter and adept at high-speed Sunday morning runs—I just have to drop back in the tighter twisties. Another possible detraction from the modified 2008 R1 is that the lower gearing means it's always pulling more revs. This means I'm constantly checking to see if it's actually in sixth. Inevitably, it's probably putting a little more strain on the engine and transmission, but there have been no ill effects to date. To give you some idea, at 5000rpm in sixth gear, my 2008 R1 is running at 65mph, while the stock 2014 is indicating 71mph—that's about a 10 percent difference at that engine speed, which is significant. But the payoff is exhilarating punch in every gear. The in-gear acceleration is also astonishing. It allows me to knock it from third into sixth and leave it there all day. It will out-pull most machines in top gear and makes it very relaxing to ride since you're not constantly up and down the gearbox. Both bikes are equipped with similar braking equipment: 310mm front discs with six-piston calipers, which are equally reassuring on both bikes. The suspension is also along the same lines, although the newer bike has more rear travel. And while I didn't play with the settings, both R1s are on the firmer side, but that's an acceptable trade-off for the subsequent stability and precision. Physically, the bikes are almost identical as well. While the 2014 has a slightly different headlight treatment, the fuel tanks and seat units are visually almost identical. For some reason, I had expected more changes in six years, but looking at the dimensions, they're within fraction of an inch of each other. The seating position is also very similar—it's overtly sporty, but not cramped. These similarities made it easier to draw a direct comparison between the two bikes, but gave the 2014 R1 an advantage over the more powerful modified example. The only real gain in six years was the tractable engine, which made the 2014 incredibly easy to ride and gives the rider a better sense of security. I was surprised to find both bikes returning an average of 35mpg on the daily commute. This was based on a calculation of fuel used and distance covered the for 2008 model. I also relied on the LCD fuel consumption reading for the 2014 bike. Both models retain the underseat exhaust placement, which can be rather uncomfortable in summer. It quickly warms the rider in the winter months and I love the way it looks, but be prepared to roast for the rest of the year. As for the mods, prices vary but you can expect to pay about $349.99 for the Bazazz Z-Fi fuel controller. It comes with fueling maps; however, the WestCoastGP Cycles tune is extra. The Yoshimura cans cost around $749. The DID 520 enduro racing chain and sprockets are about $250, while the Healtech Speedohealer is $109 on Amazon. That's takes the total to approximately $1450 plus a clutch (if needed). So what would you choose? The new model with electronic aids? Or save some money, buy a used one and modify it? In an ideal world, we'd be buying a new one and carry out similar mods to uncork it—or waiting for the R1M to arrive. But not all of us have those resources. From my perspective, I love the modified 2008 R1 and it's a testament to Yamaha—there's so much potential locked away in what is an incredibly potent machine. 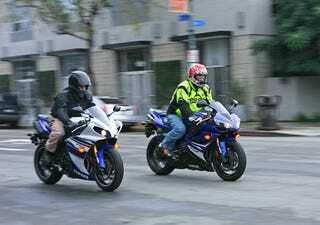 In reality, the newer 2014 Yamaha R1 would be a better candidate for newer riders, or people living in areas with worse weather than Southern California...so almost anywhere! Old or new, stock or modified, the R1 is a phenomenal superbike that rewards the rider with exhilaration and reliability.